Here are a few highlights of my work at Yahoo! 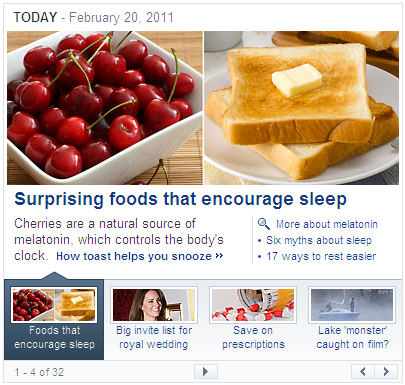 I added slide-show feature to the Today module on Yahoo! homepage. User can manually browse through the thumbnails or let it auto-play on its own. The most challenging part of this work is managing Ajax transactions, by implementing seamless re-try and fallback mechanisms. The transition between stories are as smooth as possible on slow or fast network. There was a limitation of Y! Messenger API at the time I was developing this critical module for Yahoo! Homepage GA. The limitation was that one single call returns all the buddies in your list in a flat structure, potentially transmitting very large HTML response when opening Messenger module. To minimize response given the back-end limitation, response is encoded in JSON instead on HTML. I, the front-end, populate DOM nodes on the fly. Further, in order to keep browser’s responsiveness, nodes are populated periodically controlled by a timer. 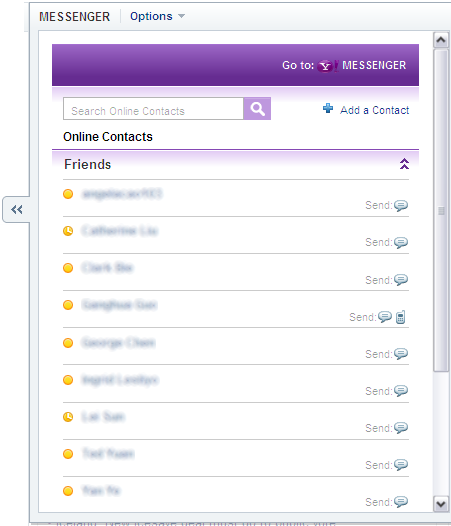 So no matter how many buddies in your list, user can still interact with any part on the page. Yahoo! 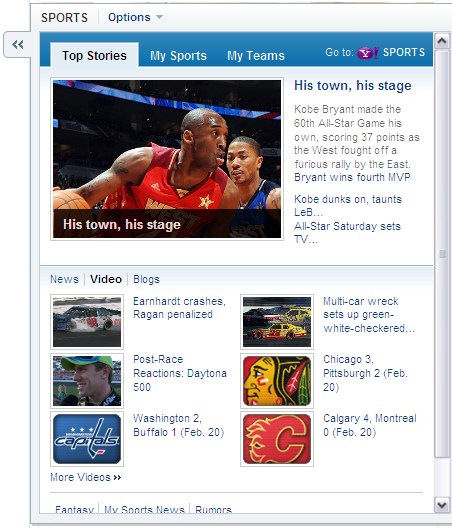 Sports module is a complex module in terms of UI – Tabs, sub-tabs, pagination and personalization. I added nearly 20 popular sports for European markets with custom built scoreboards and each has been localized. As part of Yahoo!’s Open Social initiative, I developed this Status Update feature where user can type once and post on both Yahoo! and Facebook. Although the UI looks simple, I actually spent a lot of time before coding nailing down the “flow” for signed-out user, signed-in user without Y! Profile, and user hasn’t linked with Facebook account. Working with multiple stakeholders from different department is a challenge.